Working with articles in Content Station 10 can be done in many ways. The Create New dialog is displayed. The 'Print article' icon is already selected. Step 2. Choose a template from the list to base the article on and click Next. Step 3. Fill out all necessary details and click Create. The article is created and opened for editing. Note: For more detailed information, see Creating a new article in Content Station 10. 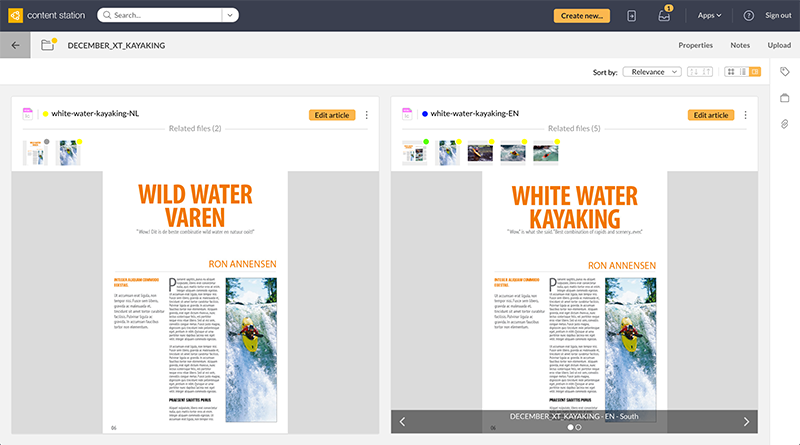 For details, see Opening an article for editing using Content Station 10. 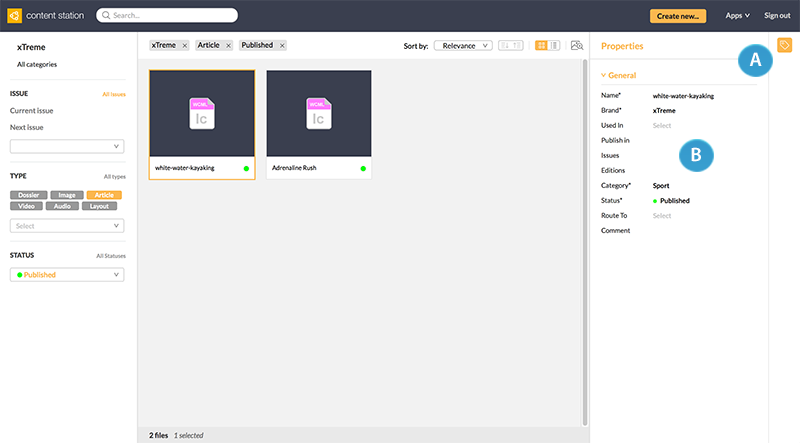 Note that by default all articles are opened in Content Station itself. If needed, they can instead be opened directly in Adobe InCopy. Edit window. Used for editing the article by changing and styling the text, adding or removing article components and so on. Layout preview. Shows a preview of the layout that the article is placed on. This gives you a good view of how the article is used. 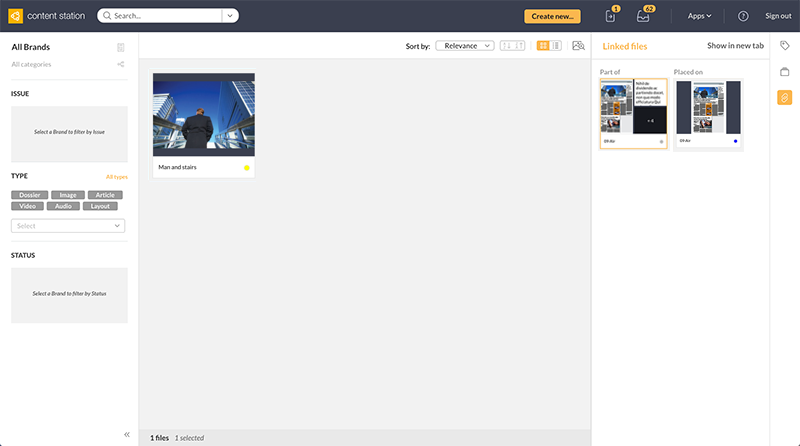 When the Images panel is also opened, images can be placed and cropped. Images panel. (Available since Content Station 10.32) Used for placing images on the layout, cropping the images or removing placed images. Shows all images that are placed on the layout on which the article is also placed, as well as all images that are in the same Dossier as the article. Use the View options at the top of the page to show or hide each area. 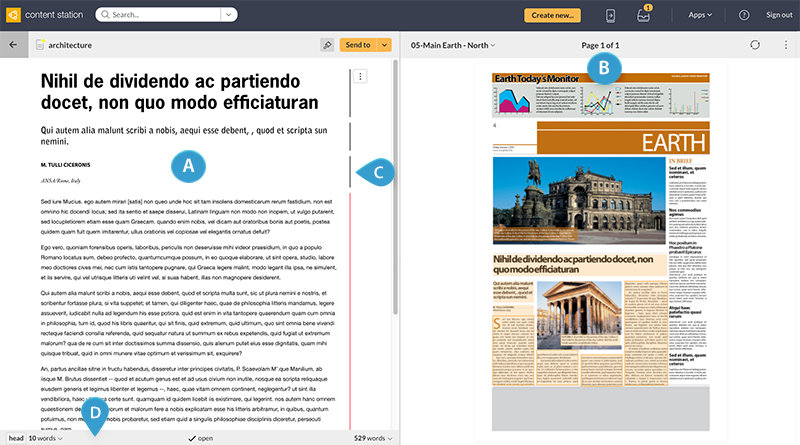 Figure: Use the View options in the Print editor to show or hide the Print editor (A), Layout preview (B) and Images panel (C). 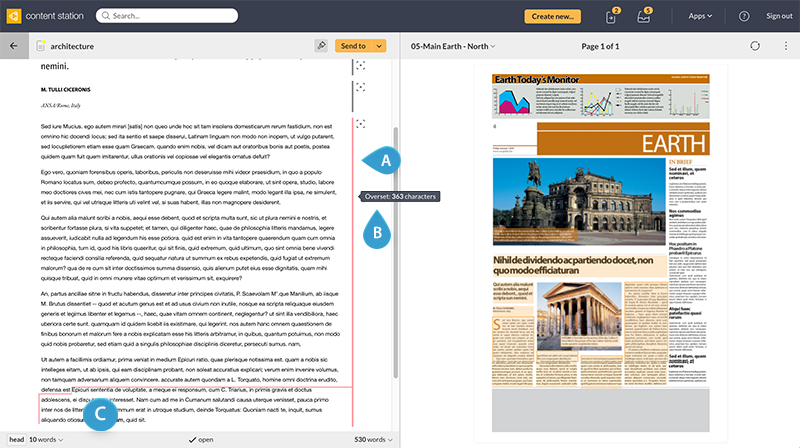 Figure: The Print editor with the Edit window and Layout preview shown. 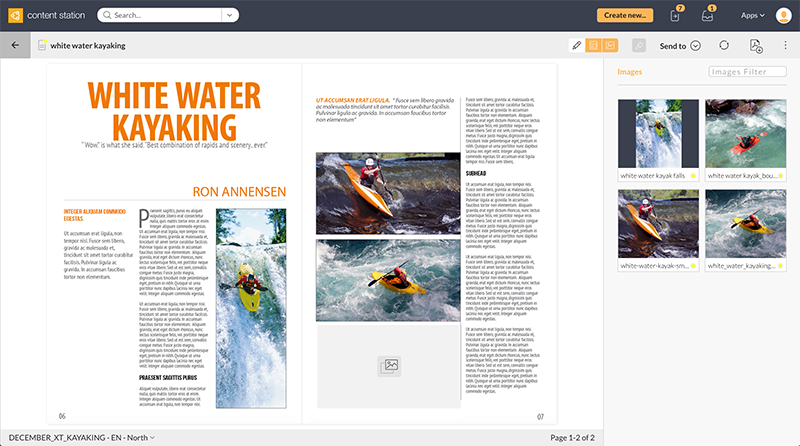 Figure: The Print editor with the Layout preview and Images panel shown. By selecting the article in the Search results, accessing the Properties pane, and changing the name. Using the Print editor is straight forward and self explanatory. Some points to be aware of are listed below. Note: For detailed information, see Editing an article in the Print editor of Content Station 10. 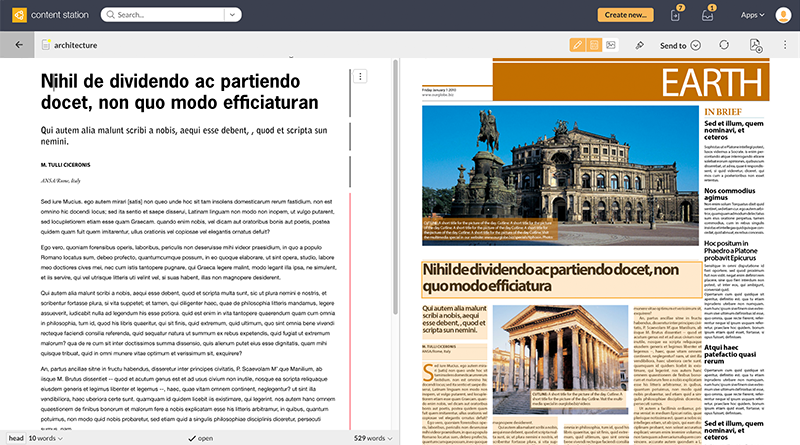 Figure: The Print editor of Content Station 10 with the Edit window (A), the Preview window (B), article components (C) and the Status bar (D). 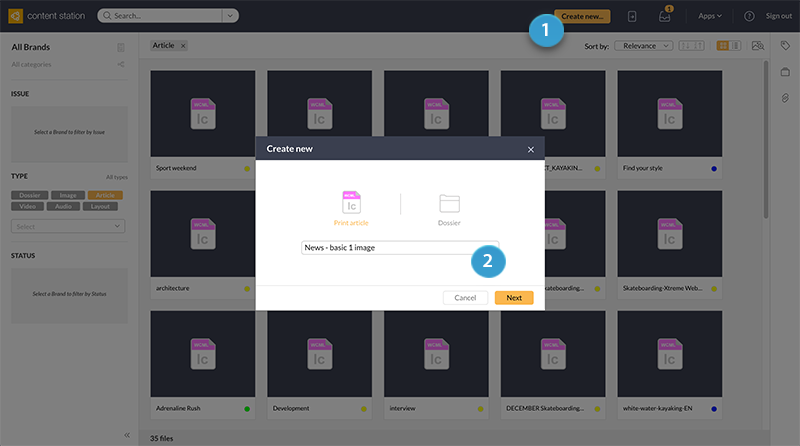 Depending on how Content Station is configured, any changes you make are either automatically saved or you need to save them manually. The article that you are editing is automatically highlighted in the preview, while the article component that you are editing is further emphasized by a border. Figure: For articles that are placed on a layout, a preview is shown which automatically updates when making changes to the text. To better see where on the layout the article is placed, it is automatically highlighted in the Preview window while the article component that you are editing is shown with an extra border. 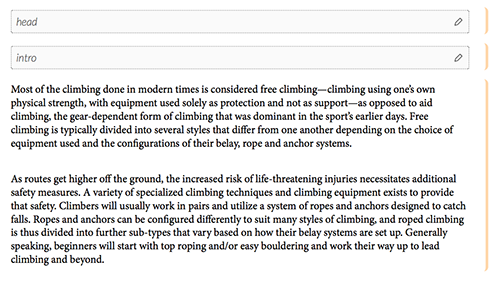 Open the Styles panel to apply a paragraph style or character style to some text. In Content Station 10, an article component can be recognized by the vertical bar that runs across the full length of the component. Article components that are empty appear as a gray box containing their name. Figure: An article with 3 components: an empty 'head' and 'intro' component and a 'body' component containing text with 2 paragraphs. Tip: When placing your cursor in a component, the name of the component is shown in the Status bar at the bottom of the screen. Components can be added or removed. 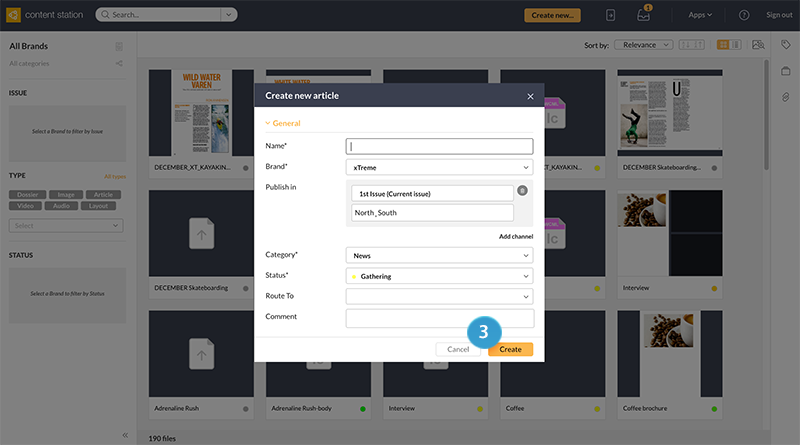 For more information, see Adding or removing article components in the Print editor of Content Station 10. Using Adobe InDesign, a layout designer can add one or more 'anchored objects' to the text in an article. This is essentially a frame containing text or an image that is 'anchored' to a specific location within the text in the article. The frame can then be positioned anywhere on the layout — even outside the frame it is anchored in — but when moving the text in which the frame is anchored, the anchored object also moves. When opening an article that contains an anchored object in the Print editor, note that the text of each anchored object is displayed in a separate component, and that each of these components directly follows the component that they are part of. Info: This feature requires Content Station 10.10 or higher. Articles that are placed on a layout need to fill a particular space on the page. When the article contains more characters than can fit in that space, a scenario known as 'overset' exists. Obviously, it is important to be aware of such situations so that they can be corrected. A divider appears in the text itself to indicate exactly from which point the text is overset. Content Station 10 runs in a Web browser and each page that is visited therefore has its own link or URL. For more information, see Bookmarking and sharing Content Station 10 links. 15 November 2017: Added section 'Changing the name of an article'. 5 October 2017: Added section 'Showing or hiding different working areas'. 10 August 2017: Added information about anchored objects.